At the law firm of Robin Simpson Smith, Attorney at Law, we combine more than three decades of experience with a commitment to personal and attentive legal representation. We work with clients throughout Prestonsburg and across Eastern Kentucky. A skilled problem-solver, lawyer Robin Simpson Smith draws on her experience serving as a domestic relations commissioner to develop solutions-oriented strategies in her roles as advocate and mediator. She enjoys a well-respected reputation in the legal community. 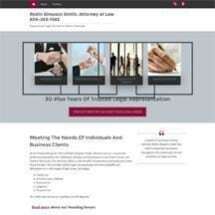 Clients appreciate her one-on-one approach to addressing their legal needs. For more information about our practice, or to schedule a private consultation, please call 606-263-1582. We offer standard weekday appointments as well as evenings by request.